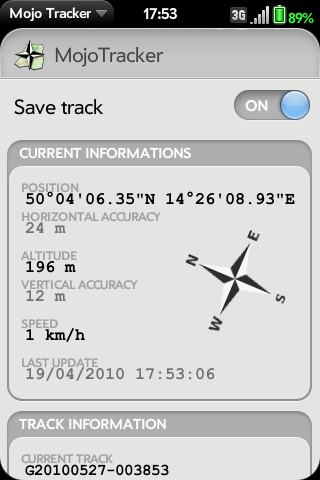 MojoTracker is an application that acquires GPS track points from the Palm Pre built-in GPS. The track points are stored internally in your phone. Later, you can view it and export to standard gpx data file directly by MojoTracker. For export functionality is required FileMgr service. We developed this App primarily to assist with our contributions towww.openstreetmap.org, which is a non-commercial mapping project. Add preference page, make posibile specify prefered units.